I’ve heard about Yafray so much and I’ve seen that it can deliver VERY photorealistic shots. 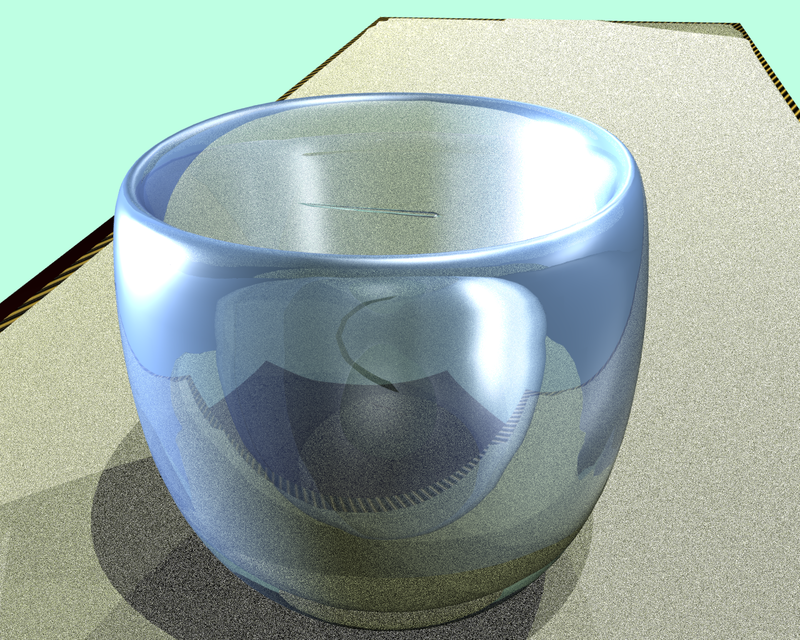 The Blender internal renderer is not bad – as a matter of fact, it’s awesome. However, for all the really realistic stuff people tend to use Yafray. I tried to use it before, but all I got was a blank screen. Today, doing some research, I found out that, for some reason, the lights need to be jacked up in order for Yafray to work. Click on any of the pictures to see a larger size. 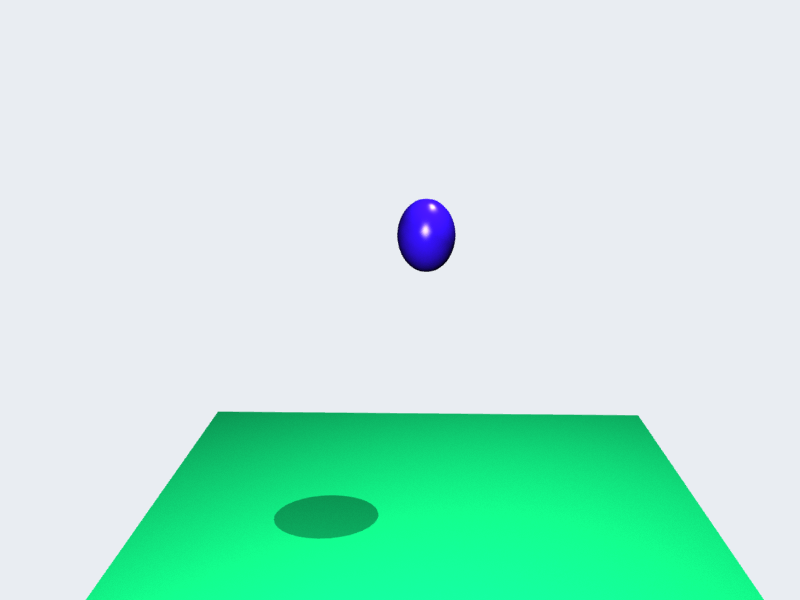 For my first example, a nice simple frame from my bouncing ball animation, I had to take the light from 1 to 6 in intensity to get it to look similar in light intensity to the Blender internal renderer. Here’s how they look. They pretty much look the same to me, perhaps you can see a difference. 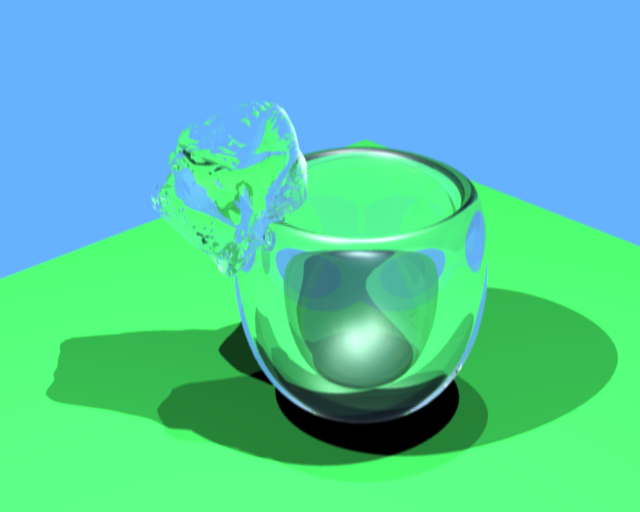 Then I decided to render the glass from my final exam. If anything, that should give a good example of how much more realistic Yafray is. I didn’t change any of the default Yafray settings. I didn’t use the exact same setup in this one for both shots because I forgot to save the file after setting it up last night. It took a while to render – over 20 minutes. I didn’t want to do it again, so I wasn’t super scientific. It looks clearly much worse with Yafray. Perhaps I’m doing something wrong here? All I did was tweak the lights so that it wasn’t darkness. Finally, I wanted to try one more thing to see if it really looks different when it counts. Here’s a shot of water hitting my glass. 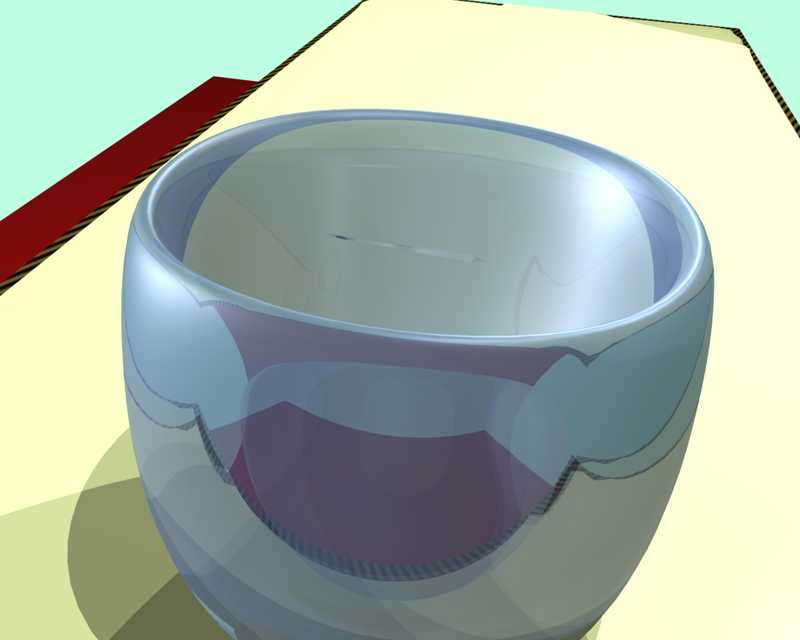 Here, the Yafray render doesn’t look as bad as above, but I still prefer the internal render. So does anyone have an idea of what I’m doing wrong? Or is this the way it should be? I am using the latest Yafray and Blender stable builds – or whatever is in the Fedora repositories. I can’t see where you’re doing much of anything wrong. I’ve never tried Yafray except I think once. You’re right that it’s very comparable to Blender’s internal. There’s some things I guess either of them best the other at, but I believe it’s about even between the two. One renderer or another isn’t what you’re missing. What you’re missing is… light. Broad day light. Lucid lamp in a dream light. Soft spot light. That’s why you have this odd feeling of being perched on the edge of a chasm which you haven’t explored yet. Blender is a great mesher. But it’s a mesher. POVray is the one you haven’t explored yet. Using the KPOVraymodeler in KDE you can draw stuff out of primitives and dialogs. It’s 10 times quicker to learn than Blender. And you will make light your new gang member. But in the end, you’ll be disappointed because POVray can’t mesh for a rat’s hat. You need Blender to mesh. We need a singularity. I can never leave POVray behind, because I can script it, and I can’t script Blender. The day that somebody finds the best of both worlds between POVray and Blender, that will be the dawn of a new sun. Make no mistake, we’re each good in different areas. I just opened my copy of Blender, and it was like learning to walk again. It’s been that long. Also, I couldn’t tell you which end of the camera to look thorough, whereas you’re a master of photography. Then you get to rendering the still images, and you seem to vault right over those on your way to animation. Where, I’ve always stayed with still images, since I have no photography skills to replace them with. Then you are exploring pure movie animation while when I put things in motion, the first thing I think of is games and interactions. 1. 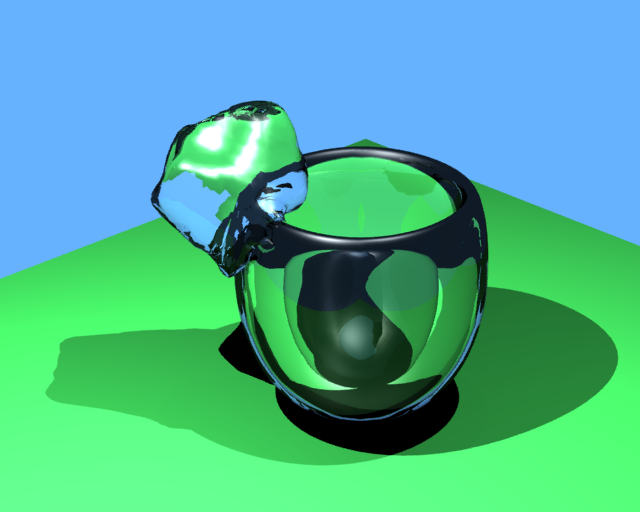 The galleries show that, indeed, Blender’s own internal renderer can now do anything that POVray can do. I don’t know where all this came from – the last time I was into Blender, the gallery was about eight pictures of simple Pixar-style cartoon characters. Where did all this photo-realistic stuff come from? 2. It seems that it can be scripted from Python, from some tutorials I’ve seen. I kinda half-knew this, but lately it seems there’s a lot more development to make scripting straight-forward. But that’s our Blender – constantly re-inventing itself! So much so that it discourages me from trying to re-learn it at every version until there comes a times when it is certain that they’re done thrashing it around and I can devote the time to learning it without having that new knowledge become obsolete in six months. You’re definitely behind on the galleries, but you’ve been busy with a certain race. There’s a great python script that came with my blender book that allows you to do Lord of The Rings-style battle scenes – provided your computer is strong enough.